The first time the Metropolitan Opera staged Richard Strauss' Salome ninety-seven years ago, J. P. Morgan's daughter blanched at the sight of a soprano making out with a severed head, and the production was shut down after one night. The ballerina who had performed the Dance of the Seven Veils on the Met stage decided to take her act to a vaudeville house, where she had a considerably warmer reception. America was soon in the grip of a Salome craze. In January, 1909, Strauss' opera reappeared in triumph at Oscar s Manhattan Opera House, with the bewitching Mary Garden in the title role. 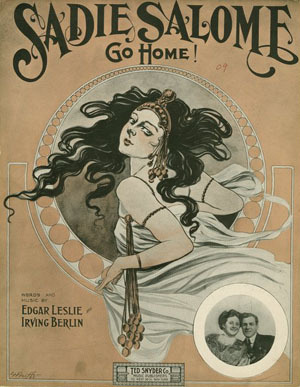 Not long afterward, a singing waiter at Jimmy Kelly's, in Union Square, wrote a song entitled "Sadie Salome (Go Home)," which told of a nice Jewish girl who dismays her sweetheart, Mose, by playing Salome on stage. "Don't do that dance, I tell you, Sadie," Mose pleads. "That's not a business for a lady!" It wasn't much of a song, but it sold well enough to win its composer a job on Tin Pan Alley. A few years later, he wrote "Alexander's Ragtime Band." The part missing from the above is who popularized this song first—none other than the not-yet-famous Fanny Brice herself! She lied her way into a principal role in a burlesque show by claiming she had a specialty song. She got the role with her answer, so then she had to find herself a song! She went to a music publisher, happened upon the also not-yet-famous Irving Berlin, and learned from him his two latest songs, one of which was "Sadie." He taught her to sing it with a Yiddish accent, but she brought to it her natural comedic instincts, dancing a self-mocking parody of the Dance of the Seven Veils, then the rage of vaudeville. The first time she sang it, the audience demanded an encore, and from there her career soared. That's not a bus'ness for a lady! "Who put in your head such notions? Who put in your back such funny motions? As a singer you was always fine! Sing to me, 'Because the world is mine!'"